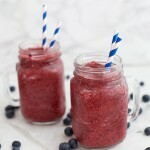 This blueberry peach smoothie is loaded with natural color, sweetness, and nutrition. They’ve been on repeat over and over lately! 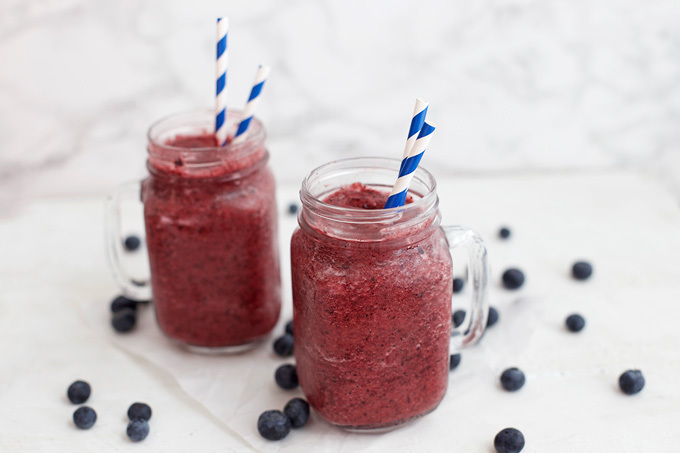 Smoothies are giving me LIFE this year in a big way, whether that’s smoothie bowls, smoothie popsicles, or a nice cold glass full. 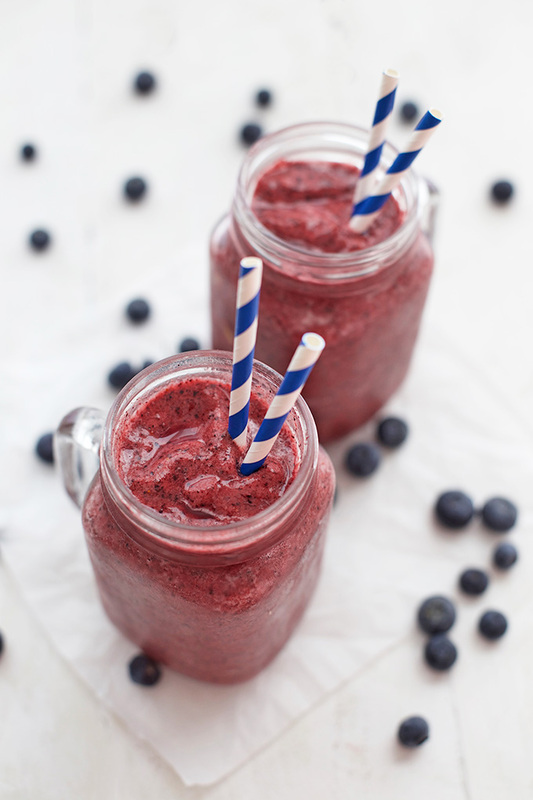 These blueberry peach smoothies were actually sort of a happy accident. I may or may not have gotten carried away one week when blueberries were $1.99 per pound (not per 6oz), and I’d stocked up on peaches that happened to all be ripening at the exact same time. Not wanting anything to go bad before I could get to it, I froze some of the fruit. A few mornings later, I was making breakfast and decided to go with a smoothie. The first thing I saw in the freezer was the bag of blueberries and peaches I’d frozen, and Milo was shouting “SHMOOOFIE!” so I grabbed the bag and got to work. 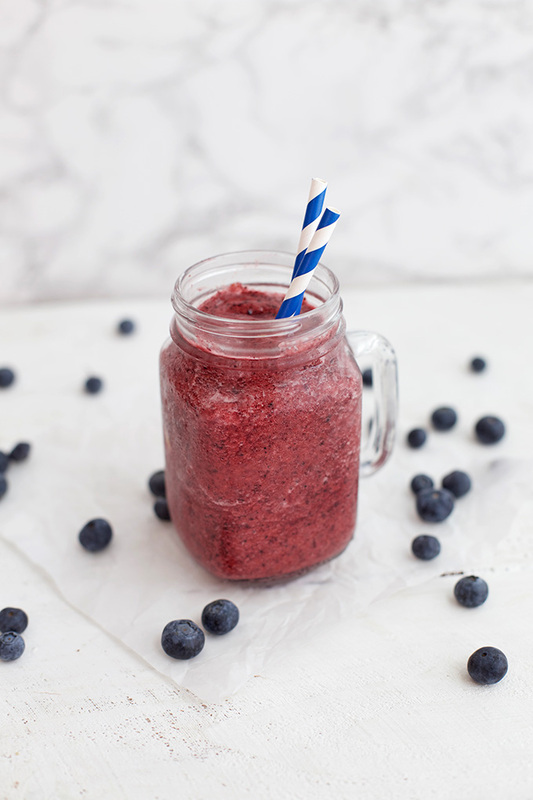 Blueberries, peaches, and a little orange juice made for an INCREDIBLE flavor combination. The fruit was at its peak and the orange juice added a little brightness, and the blended color was beautiful! I marched right back to the store and stocked up again so I could repeat the process over and over. It’s been awesome every time. 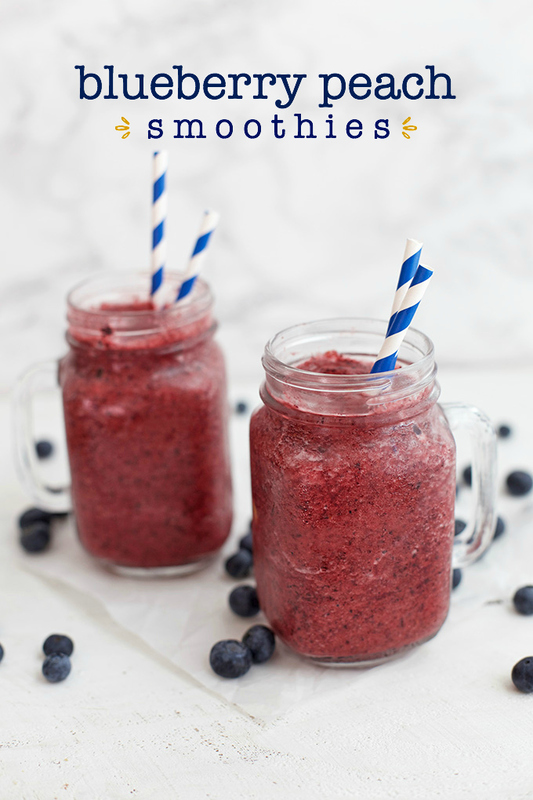 The other beauty is that if you’re using frozen fruit, it’s an easy way to enjoy these fresh, happy flavors all year long. I love to freeze my own fruit during the summer when it’s at it’s best (see the notes below for how I do that). One other thing I’ve noticed in the last few months is that I’ve found that if I don’t add some fat or protein to my smoothies (or eat some on the side, like eggs), I’m hungry again in an hour. I’ve gotten into collagen peptides lately, so I’ve been adding two tablespoons of that to the smoothie. In essence, I use it like a protein powder. It’s virtually flavorless (I don’t care for most sweetened and flavored protein powders) and it’s easy to digest. I like that it’s well-sourced, and it helps balance out my smoothies. Collagen Peptides (or collagen hydrosolate) have many of the same nutritional benefits and gut-healing properties as the gelatin in bone broth. 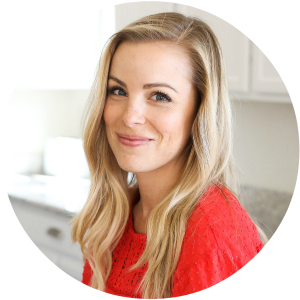 They’re high in the amino acids (protein building blocks) that benefit skin, hair, nails, hormones, and even joint health. The difference between collagen peptides and gelatin is that gelatin only really dissolves in hot water, but collagen peptides can be mixed into cold or hot liquids. My two brands of choice are Vital Proteins and Great Lakes. If you’re vegan, collagen will not be a good choice for you. If you’d like to add a plant-based “boost” to your smoothies, my go-to is chia seeds or hemp seeds. 1-2 Tbsp will do! When all is said and done, I love having a beautiful, balanced smoothie like this in a beautiful cup to start my day or boost my afternoon! Freeze your own! Whenever possible, I highly (HIGHLY!) recommend freezing your own peaches. I find the flavor is so much better than just about anything I can find in the freezer section, and if you buy peaches in the summer at their peak, they’ll be less expensive as well. To freeze them, I wash them, sliced them, place them on a pan or plate lined with parchment paper or a silicone baking mat, then freeze them for 1-2 hours until firm, then transfer them to a zip-top freezer bag. They’ll keep well for at least 3 months, but much longer if stored well. The same method works for blueberries. Fresh or Frozen. You can make this smoothie with fresh or frozen fruit. If I do fresh fruit, I like to add about 1 cup of ice for a nice frosty texture. Change it up. Depending on how sweet your other ingredients are, you may prefer to add 1 Tbsp of honey to the mixture. I also sometimes add a squeeze of lime juice to change things up. Place all ingredients in the blender and puree until completely smooth. Serve immediately! This flavor combo sounds heavenly! We’ll have to try this soon!